Between 1,000 to 1,500 light years away from the planet Earth, lays a gorgeous nebula called the California Nebula or NGC 1499. This nebula is actually one of the more challenging ones to observe through binoculars and even a low powered telescope. This is due to the low surface brightness. However, the reason why it has such low surface brightness might impress you. First, let’s get a good look at this lovely beast. Going back to our question on why the surface brightness is dim (if you had try to look at it from Earth with low powered equipment), the answer is actually right above the nebula itself! It’s the star right above called Xi Persei. This star is 30 times bigger than our own Sun! Not only that but is pumping out light at a blistering 250,000 times the rate of the Sun. Quite astonishing! If your brain wasn’t impressed just yet then imagine the size of this nebula. It’s about 40 light years long or 400,000 trillion kilometers long! Now go back to Xi Persei. That is just one star lighting up that entire nebula! Take a few steps back (okay maybe more than that!) 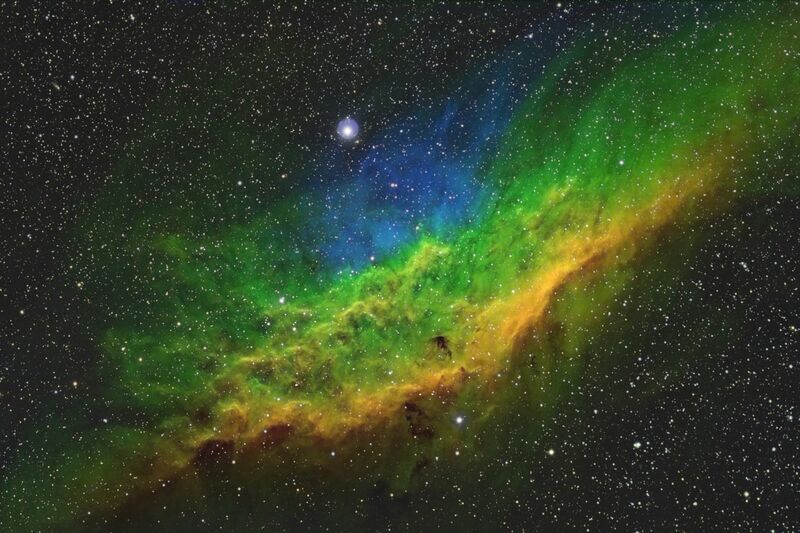 we have a beautiful mosaic of the California Nebula on the left. 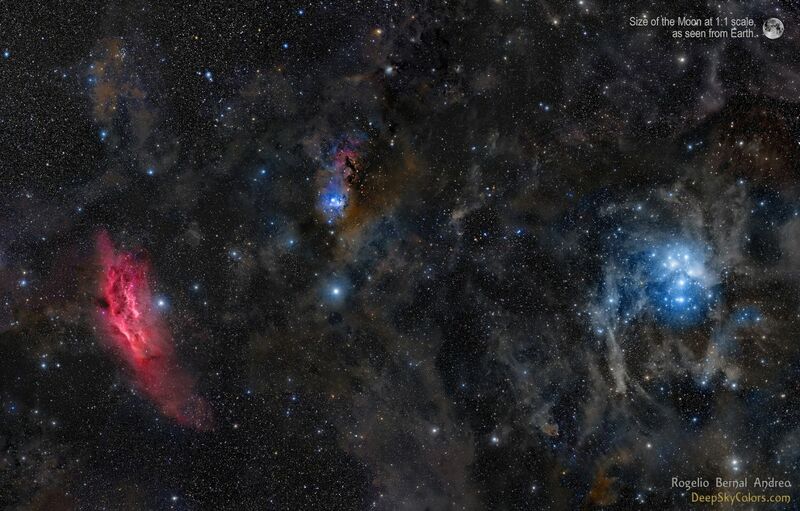 Looking towards the right we have the infamous “Seven Sisters” or Pleiades star cluster. The distance between both these famous objects are hundreds of light years. It’s amazing what we can capture with our cameras as this was taken by an astrophotographer and not NASA. It’s another reason why I love astronomy so much. Almost anyone can get into it and the community is driven to spend time and effort creating beautiful photos like the one above. Here are a few more of the first image in a few other bands for your enjoyment. 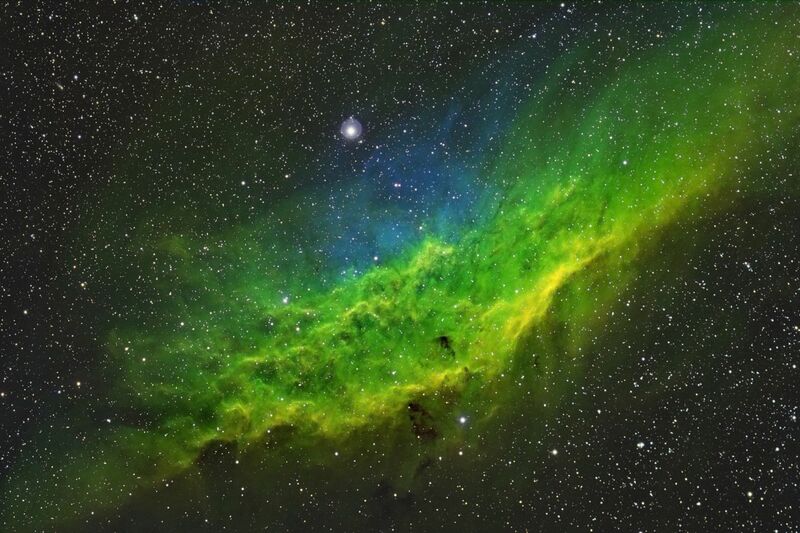 The California Nebula taken in hydrogen filter or highlighting hydrogen gas in the photo. The same photo taken by Bob Franke but highlighting oxygen (blue) and sulfur (red / orange). Taking a look at the gorgeous California Nebula as it takes us away to some true California dreamin'.